It turns out that Eat at E’s got 3rd place for Rookie of the Year at the Taste of Henry. Winning was not our goal, however, we’re glad that we got a chance to participate and help raise money for A Friend’s House, which is a charity for abused and neglected children. 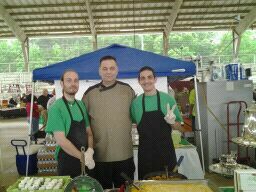 Chef E in the middle and his 2 sons. 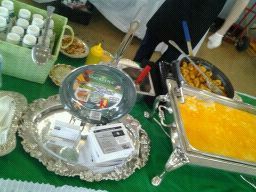 What we served was shrimp and grits and people loved it. Congratulations! Wonderful to see you here… wishing you many more success! Congrats on your win! That’s exciting. It’s amazing what we can do when we’re not even trying, but just doing what comes natural to us. Congratulations! I am sorry I didn’t get to come out to the event. Maybe next year! Thank you. Its okay, there is always next year. You can also stop by Saturdays if you would like to try our shrimp and grits. I may just have to do that. I love shrimp and grits! « Snackman – A Fun & Hilarious Way to Get Your Kids to Eat Veggies!